Friends of Sandy Bay Rivulet Inc. The Friends of Sandy Bay Rivulet is an incorporated association based in the City of Hobart, Tasmania. obtaining funds and supporting Members in obtaining funds for the above purposes through self-funding, from government program funding, community fundraising and sponsorship. Julia Greenhill has found this beautiful small orchid growing in the Ridgeway Park above the Waterworks Reserve. 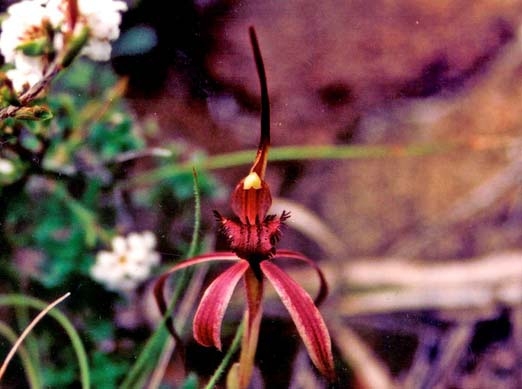 Julia has been observing these plants for several years, and as it is a Threatened Species, the location has now been recorded in the Natural Values atlas for Tasmania. Membership of FoSBR is open to residents of the catchment area of the Sandy Bay Rivulet, and to other members of the public, who support the aims of the Association.